I don't think I can come up with a better way to start describing this episode than to quote Erin: "Now I remember why I didn't watch more Quantum Leap." Quantum Leap, for anyone who doesn't know, was a fairly ambitious show with a premise that is somehow both over- and under-explained. The main character, Sam, 'leaps' through time, but only within his lifespan. He inhabits the body of another person, and helps fix something about their lives. He is helped in this by a Al, guy with a high-tech remote control computer that allows him to project himself to whenever the main guy is and provide advice and guidance, like Jiminy Cricket in an ugly 80's suit. The downside is that it seems all this intriguing sci-fi set-up is just in the service of overblown melodrama. In this episode, Sam leaps into the body of the butler of a super-rich development mogul on Christmas Eve. Raise your hand if you already know it's the plot of A Christmas Carol again! 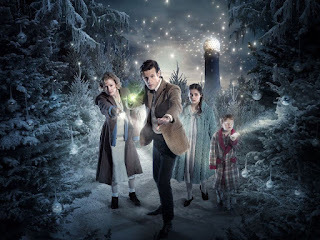 Yet another solid Doctor Who Christmas special, The Doctor, The Widow and the Wardrobe tells the story of the Doctor's interactions with a family at Christmas. Or, more accurately, at two Christmases. The episode opens with a quick Star Wars homage, revealing a massive warship orbiting Earth. Right as it's about to open fire, something seemingly goes wrong and an explosion cuts it in half. What's gone wrong, of course, is the Doctor, who's still on board and fleeing the blast. He survives by catching a space suit while being blown through space and putting it on as he plummets towards Earth. This sequence is the low-point of the episode. It was a cool idea, but something was off in the pacing leading to the explosion: we really needed a few more seconds to accept this as a potential threat before the punchline. Likewise, the Doctor's leap through space was a little too cartoonish, even compared to the comic-book shenanigans that typically permeate this series. Aww, Sofia. I wanted you to be fun. I wanted you to be clever. I like the idea of a Ur-princess narrative. But you were only sticky-sweet and not-too-terrible. 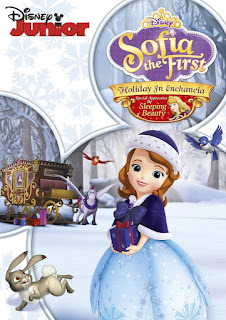 Sofia the First is an animated series from Disney Junior, about a girl whose mother marries into the royal family of a fairy-tale kingdom. According to Wikipedia, she is the bearer of a mystic amulet that connects her to advice from other Disney princesses. In this episode, we're introduced to their traditional winter-gift-giving holiday: Wassailia! It's a fairly simple fantasy Christmas. There are presents, decorated evergreen trees, and traditional foods. The most prominent point unique to Wassailia is the lighting of a special candle in honor of the season that...it's not quite clear, but it seems to bring blessings on the family. I always get depressed this time of year. 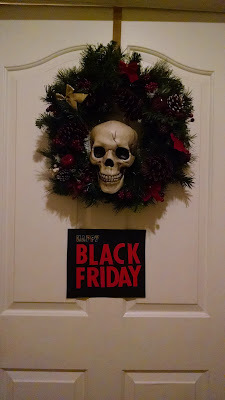 I mean, sure, I love Black Friday - who doesn't? But it always seems like something's missing. When I think back to when I was a kid, Black Friday always seemed so magical, so special. It was a time for families and friends to come together and celebrate the season. But I feel like somewhere along the way, we all lost sight of that. Now, it seems like all Black Friday is about is saving a few bucks, improving profits, or scraping bodies off the floor of a Walmart entrance. It's been over a decade since NECA started their line of Nightmare Before Christmas figures, and collectors still refer to it in reverent tones. Over several years, they produced almost every significant character imaginable from the film (with the notable exception of Santa Claus) in a six-inch scale with a wide range of articulation and generous accessories. I think most of us expected NECA's line to be the undisputed, definitive word on the subject. But Diamond Select seems to think they can challenge that assumption. 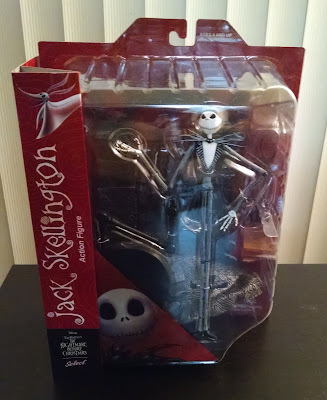 They've produced a wave of three figures from the movie: Jack, Sally, and Oogie Boogie. All are in a similar scale to the old NECA figures. Also like NECA's offering, they've gone to great lengths to add value to the toys by including some extras. While Jack doesn't come with any accessories, he does come with a huge display, as well as a more conventional stand. South Park has always been hit or miss for me, though I've never been sure whether it's the show's quality that's uneven or my tolerance for its twisted subject matter. At any rate, they've produced episodes that rank among the funniest works of animation I've ever seen and others that I would rather have a dentist appointment than re-watch. This three parter from 2013, fortunately, falls closer to the former. It's a mash-up of Black Friday, Game of Thrones, and the console wars that fits together seamlessly into a hilarious - albeit warped - holiday tale. 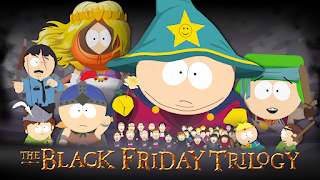 In addition, its focus on Black Friday is a welcome deviation from the norm: I find it odd more shows haven't played with the day. 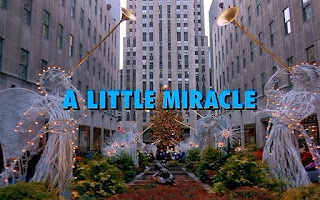 Unless I'm forgetting something, this is the only episode of the revamped Doctor Who series set at Christmas that wasn't produced as a "Christmas special." It's only the third Christopher Eccleston episode, and marks the first time him and Rose went into the past. The past they wind up in is 1869. It's Christmas Eve and - despite trying for Naples - the TARDIS takes them to Cardiff. As is always the case, there's more going on than a celebration. An undertaker in the city can't seem to keep the dead to stay still: they've picked up a habit of rising up and making trouble. One, an old woman, kills a grieving family member, climbs out of her coffin, and proceeds with her plans for the evening: catching a live reading of A Christmas Carol performed by the author, who is quickly pulled into the story. I saw this in Walgreen's and had to have it. I love the concept; it's such a ridiculous thing to make 'holiday'. The hilarity starts on the back of the package. It mentions "The snack brand America celebrates holidays with for over 120 years." Which a) is not a sentence, and b) I guess they mean Frito-Lay? 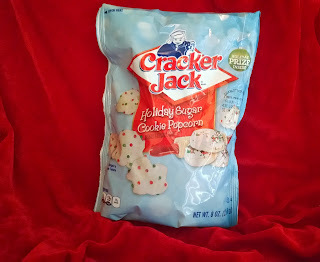 Because Cracker Jack is not a holiday tradition. If it were they wouldn't be resorting to weird seasonal flavors! The popcorn inside doesn't look like much. Part of the appeal of traditional Cracker Jack is that caramel color, and this is just white and sort of melted-looking. The red and green nonpareils are there to make sure you know it's Christmas. The taste is pretty good, though! The candy-like coating tastes of sugar and butter, meaning it does actually taste as though someone liquified some frosted supermarket cookies like the ones in the picture and poured it over popcorn. Not high-class fare, but tasty enough. A Christmas Horror Story's title might undersell the content: this is at least four distinct stories, not one, each with a different tone. The stories are told in tandem, cutting back and forth over the film's hour and forty minute run time. All occur simultaneously on Christmas Eve. They're technically connected, but not significantly. Some of the characters know each other or have some background tying them to another story, but none of what happens to them in their own tales is impacted by what's going on elsewhere. 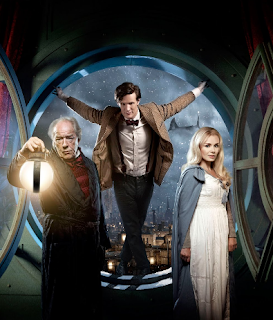 Easily my favorite of the Doctor Who Christmas specials, this episode from 2010 kicks off the second season with Matt Smith, the eleventh Doctor. This starts in the future on a distant world that's essentially a steampunk version of Victorian London. Only in space with flying sharks. 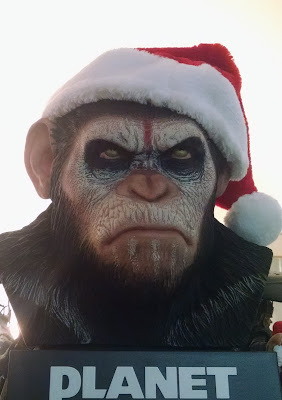 Oh, and of course it's Christmas. Well, more accurately it's the winter solstice, but the opening monologue states the obvious: they're the same thing, anyway. One of the things that makes this work as well as it does is that it really doesn't give you time to stop and question its logic. That's probably a good thing, because the premise is more than a little haphazard. It’s that time once more. We hope you’re looking forward to this as much as we are. We’ve been collecting more music, more movies, specials and episodes, and more randomly holiday-branded baubles and doodads to share with you. The sixth year of Mainlining Christmas is just hours away. Make sure you have your tickets ready.